November in southern California usually ushers in cooler temperatures and possibly rain, which means gardeners can take a break from constant care and watering of plants and trees and instead focus on adding color and fall vegetables to their gardens, say experts at Agromin, an Oxnard-based manufacturer of earth-friendly compost products made from organic material collected from more than 50 California cities. Plant Hearty Chrysanthemums: Chrysanthemums love fall. They are annuals that need very little care. Plant them in bloom and expect the flowers to look healthy for over a month. Once the flowers begin to fade, cut plants back to only a few inches above the ground. They will be dormant in winter but will grow quickly in spring and produce another round of flowers. Move Plants to Better Locations: Some plants do not do well despite our best efforts. The cause could be their location (not enough sun, too much sun), soil conditions or nearby plants sapping the nutrients they need. Fall is a good time for a change in scenery. Cooler weather means most plants can tolerate transplanting. Select a site that receives the right amount of sunlight. Prepare the soil with the proper amendments. Once transplanted, keep the ground consistently moist (but not over saturated) for the first month so roots can take hold. Keep Lawns Green: Most lawns can remain green throughout winter. For an added boost, mow lawns so blades are about 1 inch tall. Then scatter grass seed over the lawn, especially in bare spots. Sprinkle a light covering of soil amendment and water daily or as needed until new blades appears. Time to Plant Onions: It's time to plant onion seeds. The seed will need well-draining soil. If you have clay soil, add amendments to break up the chunks of clay. Plant seeds where they will get full sun. Leave plenty of space between the seeds so the bulbs will not crowd each other. Since onions have shallow roots, soil should be kept moist. Onion bulbs will be ready to harvest in spring—when the tops of the plants brown and easily bend. Dig up the bulbs and let them cure in a sunny location for several days and then in a cool dry place for two weeks. Plant Annuals: Brighten up flowerbeds with cool season flowers including pansies, calendula, snapdragons, stock and sweet alyssum. In addition, continue planting perennials, groundcovers, herbs and roses. Plant Wildflowers From Seed: Planting native wildflowers is easy. 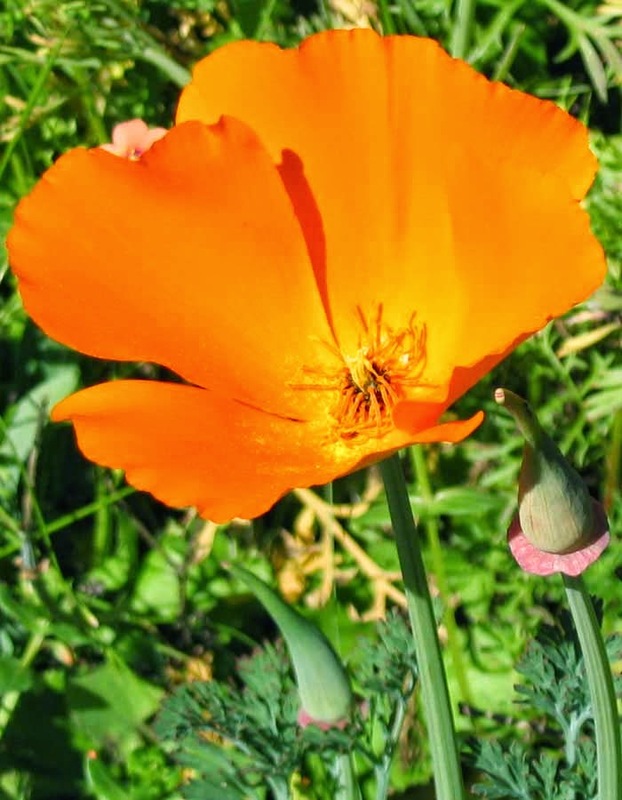 Select seed packets of the popular California poppies, and not so well known globe gilia grand linanthus and meadowfoam. Scatter the seeds in a flowerbed, gently tamp down and water.